Someone on the HoN board was contemplating Sekhmet’s near-destruction of humanity, and wondering if she was being especially nice these days to make up for it. Several people responded, saying that Sekhmet was not evil, she was doing her job at the behest of Ra, etc. I think the stories can work on a lot of different levels, and there are many lessons we can take from them. The main lesson I see in this one is that violence, once unleashed, is not easy to stop with one word. It takes on a life of its own. It may take heroic measures (LOTS of red beer, higher than several palm trees) to stop it. Sometimes violence may be necessary, but the long-term consequences can be entirely unforeseen. 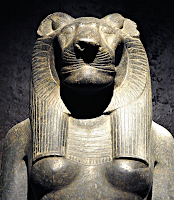 This entry was posted in Quotes and tagged Sekhmet by helmsin2. Bookmark the permalink.